In case you don't know, NaNo is National Novel Writing Month - when a bunch of crazy people (including me - this year for the first time) attempt to write 50,000 words of a novel between November 1 and November 30. It runs every year, and ended last night. Click here for more info. Going into it, I really didn't know what to expect. I didn't think it would be easy by any stretch, but I figured I'd be able to manage it - or at least come close. So how did I do? Why don't we start with my November goals, taken from last month's goals/progress post? Write 50,000 words in Handmaiden to a Princess (yes - typing that TOTALLY freaked me out!). Do NOT read every blog on my google reader (this COULD be a goal that's hard to keep, believe it or not - but if I don't, there's NO way I can get the writing done I need to!). And then there's goal #2. The one that freaked me out when I typed it. AND the one I did not meet. And that's just the tip of the proverbial iceberg. It was definitely a good experience. But what about December, you may ask? Well, here are my goals. It seems there may be something else - but that's what I'm sticking with. Thanks SO much for reading, and for your support! Onward I go! I'm proud of you for getting that much done. 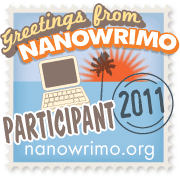 I decided not to NaNo this year and now I feel like I should have tried. Oh well, there's always next year! I've never done Nano. Really need to try it one of these times. :-) Ah, the pressure! LOL But good job on all your goals! Jo, you did fantastic! 30k is great!! And learning what you did is FABULOUS!! Way to go, my friend!! Definitely, 30,000+ words is fantastic! You did a phenomenal job, PLUS you learned about yourself. I'd say it was a stellar month. GREAT job, Jo! Of the six times I've done NaNo, I've only made 50K twice, but was a winner every time because I was doing my passion, writing fiction like crazy!